Oh, poor Elephant drives himself crazy wondering if Piggie will want ice cream or he should just share his ice cream, that as time passes, his ice cream melts. 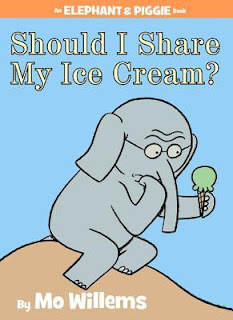 This story was quite whimsical as many of the children in the reading group were adamant that ice cream should not be shared as then they would have less. It was quite amusing to watch their little heads work to try and solve this “problem”.